Cyrus Suryo-di-Puro Whose Interests Are Money, the Paranormal, Playing jazz, fusion & pop. on Friday, 29th. January, 2 months and 19 days after his 25th. birthday. This page was added on 11 February, 1999. Updated 12 April 1999. Last update 28 January 2000.
because I failed him as his Father. The death of a child is very private because it is the private pain of a family. More so because he was a young adult of 25, this family's youngest child, whose full potential was never realized. But the grief and the love displayed by many beyond our family — by friends, Cyrus friends who kept a night long vigil by his remains, and others whom we just met, were so overwhelming that perhaps others — especially those who have their own children — would care to share in our grief, and the grief shown by those who knew him. More important, they can perhaps learn from this sadness and to take care of their child, and God forbid, not to ever one day to ever go through this pain, like we are going through this pain. “... No one, I repeat no one, can feel what we parents feel when we loose a child, unless one becomes a parent, saw the child grow up, and then die on them. “The pain is so devastating that bereaved parents will trade their lives for their child’s, and trade all their material wealth – and become a pauper – just so not to loose their child. And even to think about committing suicide – an unthinkable thought for all rational persons – when they loose their child ... if not for the sin of throwing one’s life unto the face of God ... and if not for the anger and hurt bereaved parents will cause to their other children and loved ones still to live their lives. That's how painful loosing a child is. “Beareved parents are like those whose house was burning. They were in it; were badly burnt and injured, but they survived with burnt pains. But the observer sees the burning house, sympathizes, and only feels the heat. The observer – those who have never lost a child – will never feel the pain of those who were burnt, no matter how hard they try to imagine the pain; the long recovery needed for the burns to heal – like the recovery from thoughts of committing suicide and bargaining with your God (I’ll trade my life for my child’s), and the scars that stay which will never go away – that mental scar lingering in the back of one’s mind that something is missing in their lives, unless the observer was burnt himself – and experienced the death of his child himself. “And ... do NOT think this pain and tragedy whether by sickness like Cyrus, or by any other kind of tragedy – accidents, war and other unmentionable tragedies, “only happen to other people. Not us” – as we once thought – when we started this family in our mid 20s and now in our mid 50s autumn years, and after 35 years of parenting. “It can happen to anybody, at any time, and hit you without warning like a bolt of lightning. So love and appreciate your Child so if the Creator takes him/her away – and heaven forbid this won’t happen – you know that as a parent you did your best. Because the worst thing anyone can feel is guilt, the guilt that comes from within you–that perhaps one could have been a better parent, and had done things in a better way. “The older and longer this child is with the parents, the deeper the pain the parents feel this devastation because the older child has established his/her new world which he/she is preparing to step into, like new circle of friends and their very individual and their very own unique experiences which we as parents then became part of. All of this is suddenly gone. “ Single persons, married couples with no children, can never visualize, or feel the utter deep pain parents feel when they loose a child. They can only experience it when they become a parent, and if , I repeat if, their child dies on them. “If parents with children have never experienced the death of their child, they, too, will never feel this pain. They, too, are only observers...and will never know how it is to have their young promises yanked from under their feet. and updated again on the 1st. anniversary of his passing on January 28th. 2000. The baby of the Suryo-di-Puro family is literally the baby of the family, and his 25th. is on November 9th. 1999. We timed his birthday to exactly the same date as Laila's his older sister by 8 years, November 9th. First, by taking a calculator and calculating the dozens of different variable factors like position of the sun, moon and venus, the weather, the parents' blood pressure, etc. to arrive precisely on the desired date of birth (just kidding). (At the age of 8 at a wedding as a groom's valet; right eating Mom's chocolate cake). But a doctor here in 1972 advised them how to choose a male or female by date of ovulation by using a thermometer, and other things, and he was the result. First, advises the doctor, the male sperm cell moves much faster than the female, leaving the female behind. But the female's lifetime is twice as long, e.g. 24 hours, while the male's is 12 hours. Second, when the female body ovulates and is ready to receive the sperm, her body temperature rises by one or 1½ degrees centigrade (we use the C° here). This usually last 3 to 5 days, depending on the woman. Third, take her temperature regularly in the morning and in the evening for a minimum of two months, so one has an idea of her temperature graph, the days she ovulates. Make this graph 3 to 4 months if the woman's period is irregular. Fourth, the male has to be healthy (the woman, too, obviously) and is advised to strengthen his health with vitamin supplements on the 3rd. month of MB (Make Baby) Day. On MB Day, if you choose a female baby, choose one day before the egg is ready which is determined by the woman's temperature graph. This way when the sperms travel, the males will reach the unfertile egg first, will die off, and the female sperms which are travelling slower, will reach the egg which then has become fertile for the female sperm to fertilize. For a male baby, MB Day is the first day of ovulation. That's how we got Cyrus! Everybody in the family claims he is spoiled, except his Mom who says that is not so. Cyrus is a book worm, reads anything and everything from comics to literature, most days until 2 a.m., gets up at 8:30 and at his appointments by 9:30. He's also a good big bike rider. He rides his Dad's Kawasaki Ninja ZX-11 (called ZZR-11 in Indonesia and in Europe--the Ferrari and Lamborghini of super sports bikes). That's a 1,100 c.c. blue lightning 2-wheeled, 250 kilo (551 pound) 147 h.p. macho monster, claimed by U.S. big bike magazines to be "the King" on straight out speed and acceleration with an unmodified top speed of 200 mph (320 kph), the fastest object with an engine straight out the factory, faster on acceleration than the fastest Ferrari, the Lamborghini and the F-16 jet fighter with a speed tests of 160 kilometers (100 mph) in some 6 seconds and an unmodified out-of-the-factory top speed of 200 mph (320 kph) – according to these magazines! These big bikes horsepower are downgraded to a maximum 100 HP in Europe, so the European ZZRs are vastly different than U.S. and Asian specs. (Left foto holiday in Tehran with Mom, 1997, smoking one of those 'things' which everybody who smoke seem to smoke). One day, his Dad notices deep scratch marks on both left and right mufflers on his brand new Ninja ZX-11, parts of them beginning to rust, and asks Cyrus, what happened to the mufflers (there were no scrape or scratch marks on the body, so the bike did not fall), and Cyrus said, "Oh, that! Each time I corner, the mufflers scrapes the pavement." But that means you're practically lying down the bike on its sides," his Dad says. "I guess so," he replied. "So-and-so (a friend of his whose dad owns a big bike sales & service station) who rode with me a few times will vouch for the scratches," he said. "Just watch out and don't have any accidents!" his Dad says, visualizing his son riding the 1,100 bike like the 500 c.c. world championship bikes with knees and elbows leaning so far that they scrape the pavement. But later his own Dad was guilty of sometimes scraping the Ninja ZX-11 and BMW cruiser's mufflers on trips to Puntjak, that's 1,500 meter (5,000 feet) high mountain resort some 75 kms from Jakarta. For some reason, it's okay for dads to 'take risks'; but not okay at all for his kids to do the same. Strange ... considering that 50 year old-plus dads' bones take a whole lot longer to heal if they have an accident. (Right foto, at the neighbourhood bakers in Tehran on a holiday with Mom 1997 where they make the greatest bread by placing the dough on pebbles in a brick oven. The family's favorite early morning bread, some pebbles and all. And when Mom brought some in for Dad from Tehran, Dad asks, "Where are the pebbles?" And says, "If there are no pebbles in the bread, it's not the real thing! ").Cyrus had a very bad motor cycle accident, though. 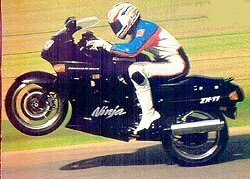 This guy who was trained in one of California's racing bike schools found it hard to believe Cyrus had an accident as he recounted his experience with Cyrus who saw for himself Cyrus' skill in handling the big 147 horsepower Ninja ZX-11. One day on a 3-day trip to the coastal resort and harbour town of Cilacap in central Java 600 km from Jakarta with a bunch of other 50 big bike riders, (with Cyrus' Dad on his BMW 1100 c.c. cruiser, big brother Arto on his Honda 1,000 c.c. CBR), this super bike racer using a 1,100 c.c. Suzuki recalled, "We were going through these great, really smooth winding mountain roads with pine trees just like Switzerland during the summer," he said retelling the story to a bunch of big bikers who missed the tour but go on big bike tours to Malaysia, Australia, Europe and the U.S., "when I noticed this Ninja following me real close. I thought to myself, 'who does he think he is following me so close. I'll outdistance him!' But no, the faster I went, the closer this guy came sitting on my tail, until in one curve ke kissed my rear wheels because the curves were so tight, and instead of backing off, he leaned even closer to the ground, scrapped his sides, and this son of a gun outmaneuvered and passed me in this tight curve. Imagine that. Me, a trained racer and this guy beats me! As he passed, I noticed, hey, that's Mas (older 'brother') Adji's Kawasaki with that phone antenna sticking out (there were 3 other same-colored ZX-11 Ninjas on that 50-bike trip minus phone antennas, and it's difficult to tell who is on what bike because of full faced helmets), but that's not his body profile. Must be Cyrus," he said quite impressed. "I cannot imagine him having that accident. It's not like him. Must be sheer bad luck," he said, when someone told him of Cyrus' bad accident which broke his left knee cap and left leg in three places. 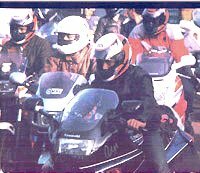 (Left foto, Cyrus on the blue Ninja ZX-11, brother Arto in white helmet on his Honda CBR 1000 waiting in line for gas with other riders). The accident took place when from a standstill, he started and was about to change to 2nd. gear accelerating from a traffic light, when a 3-wheeled 2-passenger taxi motorized tricycle in the far left lane (Indonesia is right hand drive) suddenly turned right and cut across two lanes and across the bike's path. The bike (Right photo courtesy of Cycle World) as it started, rammed the tricycle, broke it into two because of the powerful inertia the Ninja carried. The Ninja bounced off the tricycle, flew upwards to a 2 meter brick wall house fence, bounced off and fell on Cyrus' leg ... all within a space of 10-15 meters (32-50 feet). At that time the bike had the power to hurtle its 500-plus pound mass at 160 kmh in 6 seconds, so imagine the power that hit and broke the tricycle in two. His head would have been injured if it was not protected by a Shoei Japanese helmet, the kind world champions Wayne Rayne and Micheal Doohan wear (actually Doohan wears the Japanese Arai helmet), which was nearly crushed. It was not a fast, careless or hi-way speeding accident -- just a lesson of "Watch Out for the Other Driver". It would have not been such a bad accident in such a short space if it was any other bike, and if it didn't have that powerful inertia. He even nearly lost his leg from gangrene so his Mom had to take him abroad for medication. From that day onwards, Mom did not allow any three of the male Suryo-di-Puros big bikes in (or near) the house! Except for the marks on his leg, Cyrus walks o.k. without a limp (thank God).